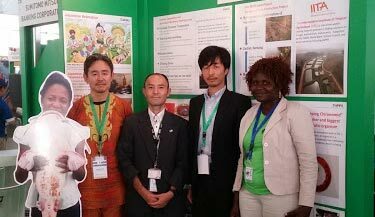 During the recently concluded 6th Tokyo International Conference on African Development (TICAD VI), the joint collaboration between the IITA Youth Agripreneurs (IYA) and Taiyo Industry Africa (TIA) received commendation from various Government officials from Japan and African countries, international organizations, NGOs, and private sector companies who visited their exhibition booth. The visitors also showed keen interest for the project to be replicated in their different countries. TIA, a Japanese private company, is currently engaging IYA in a Compound-Type Production project focused on piloting Japanese technologies for fish farming and exotic vegetable production in Africa. Under this partnership, TIA has recommended three IITA staff members and one IYA member to the African Business Education (ABE) initiative, for a youth Master’s Degree and Internship Program for Africans to study in Japan. The youth group, represented by Elizabeth Muema, co-chair, Nursery manager and Assistant marketing manager of the Kenya-based Kibwezi Hortipreneurs Youth Group (KHYG) showcased the milestones achieved from the collaboration during the event which took place on 27-28 August, in Nairobi, Kenya. Over the past 14 months since KHYG’s establishment, the group has made remarkable progress: renovating its greenhouse facilities, entering large-scale vegetable production and marketing, establishing fish ponds and fish feed production, and most recently producing crisps from sweet potato intended for local distribution and sale. 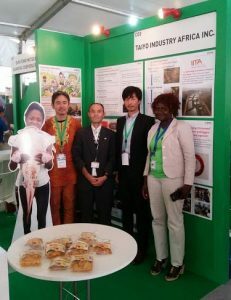 Yukio Yamamoto, IITA-Taiyo Project manager, pledged the continuous support of TIA to IYA and expressed enthusiasm that the goals set by the project will be ultimately reached. “The success of TICAD VI has shown that there is a huge prospect for the continuous business relationship between IYA and TIA. TIA will continue to advertize IITA activities as opportunity and occasion present… TIA’s aim of reaching a win-win relationship with IITA-TIA farmers in agricultural development will be achieved,” he said. TICAD VI is a summit meeting on African development co-organized by the Government of Japan, the United Nations Office of the Special Advisor on Africa (UN-OSAA), the United Nations Development Programme (UNDP), African Union Commission (AUC), and the World Bank. This is the first time the summit (bringing together 35 heads of state and government, among which were 23 African presidents) was held outside Japan with unprecedented benefits for Africa.